Unfortunately I will be unable to attend Hugglets next week after all. So, I have decided to list some little bears for adoption in my Etsy shop. The first two bears listed are Delphinium and Olivia - please see the link to my Etsy shop for further details. I just wanted to share some of my work in progress. 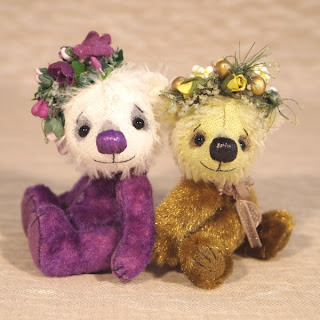 These bears will be part of the new collection which will be available at the Hugglets show in September. It seems that at long long last the Spring has arrived. Although its struggling to stay warm, my garden is starting to spring into life and its heart warming to see all the new buds coming through. I've been working on a collection for the Hugglets show in September. I hope to give a little preview nearer the time. But for now... Back to the sewing! Harry is a tiny little morsel of vintage velvet bear who is sporting a little ribbon bow tie. He is now available for sale in my Etsy shop along with some tiny chicks and a bunny just in time for Easter. I can't believe 2012 is drawing to an end - it doesn't seem like 5 minutes since it was January! I haven't made very many posts this year as life has been hectic and doesn't show any signs yet of slowing down. I have still managed to do some sewing though and Jack is one of my latest creations. He's still feeling rather patriotic and celebratory after all the summer festivities of the Golden Jubilee and then the Olympics. So, Jack is sporting a rather handsome Union Flag bow-tie. Last Sunday I attended the wonderful Hugglets Teddies 2012 Bear Festival at Kensington Town Hall. It was a lovely day as always and I had the chance to catch up with many old friends and meet new ones too. I didn't have to bring too many bears home with me as many of them had found new homes. 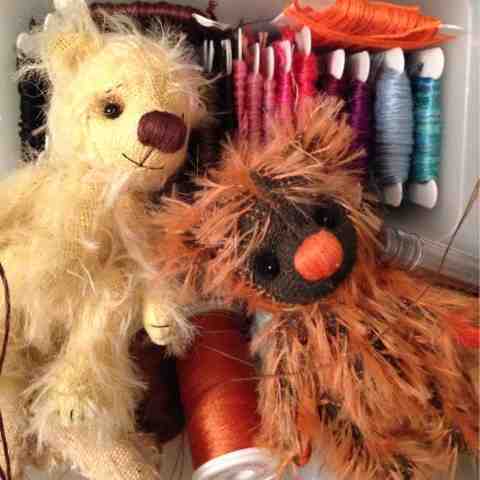 Some of the bears that I did bring home will be posted on Etsy over the next few weeks. It's been such a long time since I have managed to post anything - all I can say is that 2012 so far has been 'epic'!!! So sorry to anyone that has been looking for updates and has been disappointed. I was at Hugglets Winter BearFest last weekend and as always it was a wonderful day of meeting collectors old and new and catching up with other bear artists. Many of my miniatures were adopted into new hugs and the festival was a great opportunity to show off some of my new creations. 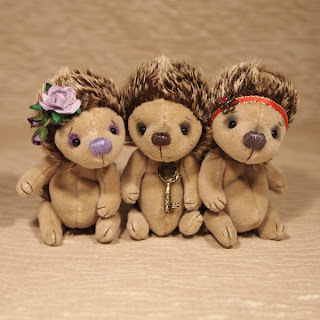 One of the new designs on show was a new style of baby hedgehog (the hedgehogs shown above will all be available to adopt in my Etsy shop very soon!). Also on show was a set of teeny tiny bears just a shade over two inches tall. They have been made from vintage velvet fabrics and wear a pair of rusted bells around their necks. 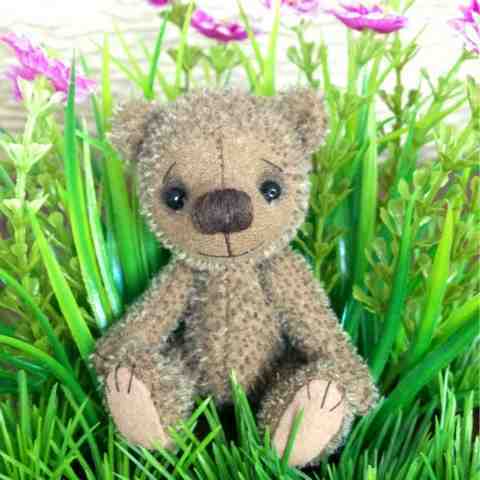 I have just three of these bears available to adopt and they too will be in my Etsy shop very soon. Teeny tiny bears getting a hug from big bro! 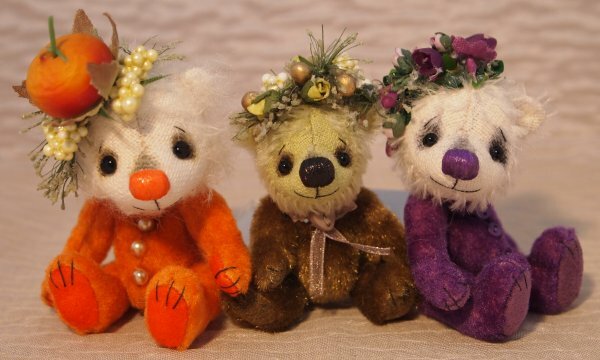 If you would like to be notified when new bears are available to adopt, please email me with your full name and email address. If you would like to adopt a little bear or animal please contact me for details. Most of my creations are between 3 and 4 inches high from the top of their head down to their little tippy toes. I love to work with the best quality fabrics and materials available and love to weight my bears' tummies. 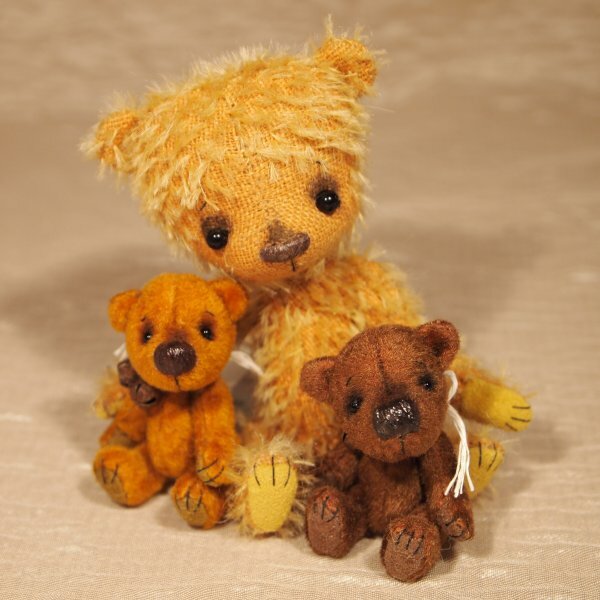 Each bear is hand sewn, stitch by tiny stitch, with much love and attention to detail. If you need any information, please don't hesitate to contact me.